In a major update tonight of its Creative Cloud service, Adobe released the "CC" versions of its desktop applications, including Photoshop CC, and integrated the Behance community into the service. "We've added a ton of new innovation to all our CC desktop apps like Photoshop, Illustrator and InDesign," said David Wadhwani, senior vice president and general manager, Digital Media, Adobe. "These apps include new features that increase productivity, streamline the effort to build mobile content and showcase some stunning new imaging and video science. "And in addition to the traditional areas of innovation these apps are now connected to the powerful publishing and community features integral to the Creative Cloud experience." Current Creative Cloud subscribers can use the Adobe Application Manager to look for New Applications to find the downloads. 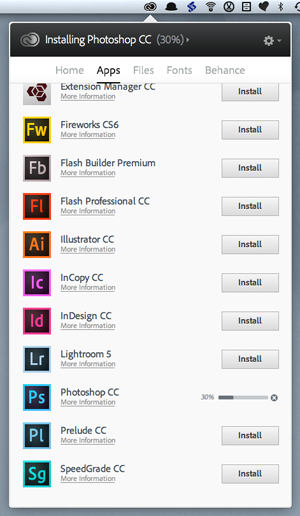 The prior CS6 versions are listed first as "Up To Date" and the new CC versions are listed under them with an "Install" option. A progress bar is displayed instead of the "Install" button for applications that are downloading. At the same time, Adobe has launched Create Now: a Celebration of Creativity. During the program's first month, the company will host a variety of collaborative art projects, commemorate the birthday of a design icon and provide a forum for creatives to use Adobe tools to express themselves "in fun, engaging and unexpected ways," Adobe said. Photoshop CC. Our first screen shot of the new version. More details are in the press release below. SAN JOSE, Calif. -- Adobe has announced that a major update to Adobe Creative Cloud, the company's flagship offering for creatives, is now available. Unveiled at Adobe MAX, The Creativity Conference, in early May and packed with new features, this Creative Cloud release reimagines the creative process through a stunning set of "CC" desktop applications and sophisticated cross-device collaboration and publishing capabilities. Creative files can be stored and shared, via Creative Cloud, on Mac OS, Windows, iOS and Android; and Behance, the world's leading online creative community, is now integrated with Creative Cloud, so customers can showcase work, get feedback on projects and gain global exposure. "We've added a ton of new innovation to all our CC desktop apps like Photoshop, Illustrator and InDesign. These apps include new features that increase productivity, streamline the effort to build mobile content and showcase some stunning new imaging and video science. And in addition to the traditional areas of innovation these apps are now connected to the powerful publishing and community features integral to the Creative Cloud experience," said David Wadhwani, senior vice president and general manager, Digital Media, Adobe. "And with even more great updates coming to Creative Cloud throughout the year, we can't wait to see the incredible work our customers are going to deliver." With Creative Cloud, publishing finished work has never been easier, with enhanced services that build and power Web sites, mobile apps, tablet publications, online portfolios and content for virtually any medium and device. Creative Cloud Experience on the Desktop. With the new Creative Cloud desktop app, your entire creative world is synced and organized across your desktop, Web site and mobile device. You can stay connected to work on Behance; track feedback; and install and manage apps and updates. More features will be added soon to manage your files and desktop fonts within this same experience. Integration With The World's Leading Creative Community. With Behance now integrated with Creative Cloud, members are able to publish their own portfolios, follow other creatives, publish work-in-progress from within a growing number of CC apps and solicit feedback from the worldwide creative community. Over 1.4 million creatives globally are part of the Behance network. Store, Share and Collaborate. All files and assets can be shared between the desktop, cloud and mobile devices. A designer can take a photo on their iPad, use Photoshop Touch to refine the photo while on the go, then access that file, via the cloud and use Photoshop CC on their Mac or Windows PC to further enhance the image. Designers can send files to view, download or comment. Individual members receive 20-GB of storage. Seamless Publishing. Creative Cloud members have access to the services necessary to publish highly personalized portfolio Web sites using Behance ProSite, high-impact digital publications for iPad using Digital Publishing Suite Single Edition and PhoneGap Build to create and publish mobile apps for any device. Adobe Typekit features an unmatched library of old-classic to new-favorite fonts for use on Web sites and, coming soon in an update to Creative Cloud, creatives will also be able to quickly find the perfect fonts in the growing Adobe Typekit library, sync them to their computer and have them immediately available for use in any desktop application. Full Creative Cloud members will soon have access to over 700 fonts, installed with a single click. This update to Creative Cloud includes the next generation of 15 Adobe desktop applications -- including Adobe Photoshop CC, InDesign CC, Illustrator CC,Dreamweaver CC, Premiere Pro CC and more. Adobe Creative Cloud includes more than 30 tools and services that enable professional-grade content creation and delivery across print, web, mobile apps, video and photography. 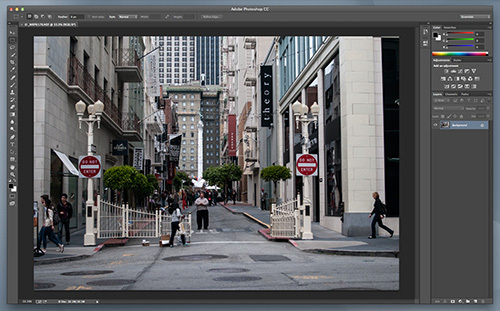 Photoshop CC ships with new sharpening technologies and designer workflow enhancements. Camera Shake Reduction deblurs images that would have otherwise been lost due to camera movement. All-new Smart Sharpen makes texture and detail pop and Adobe Camera Raw 8 adds even more powerful photographic controls to straighten and perfect images. Photoshop CC and Illustrator CC are the first Adobe desktop applications to include the ability to post files directly to Behance, showcasing work immediately and integrating peer feedback into the creative process. For designers, the Touch Type tool in Illustrator CC offers a new level of creativity with type. Move, scale and rotate text characters knowing that it remains editable. This feature works with a mouse, stylus or multi-touch device. Illustrator also enables painting with a brush made from a photo. Art, Pattern and Scatter brushes can contain raster images, so designers can create complex organic designs quickly, with simple brush strokes. And Illustrator CC features integration with Behance, so work can be shared directly to Behance to get feedback and showcase projects. A new, modern architecture for InDesign CC turbocharges performance and in-browser editing in Adobe Muse CC -- a tool for designers to create and publish HTML Web sites without writing code -- allows clients to make edits to a published Web site, which can then be reviewed, approved and updated by the designer. For video customers Adobe Premiere Pro CC includes dramatic new editing features, customizations and improvements to help editors work efficiently. Premiere Pro CC integrates powerful color workflows, with the addition of the Lumetri Deep Color Engine to easily apply rich color grading looks. A high-impact version of Adobe After Effects CC brings motion graphics and visual effects artists more creative possibilities and allows them to work more easily in 3D with the new Live 3D Pipeline with Maxon Cinema4D integration. There are also all-new versions of Adobe SpeedGrade CC, Audition CC, Prelude CC and Adobe Story CC Plus. To mark this introduction, Adobe has also launched Create Now: a Celebration of Creativity. Over the course of the program's first month Adobe will host a variety of collaborative art projects, commemorate the birthday of a design icon and provide a forum for creatives to use Adobe tools to express themselves in fun, engaging and unexpected ways. More information is available at: http://adobe.ly/createnow. This major update to Creative Cloud is available now. Current Creative Cloud members receive all of this innovation as part of their existing membership, at no extra cost. Special promotional pricing is available to existing customers who own CS3 or later. Individual, education, team, government and enterprise membership plans are available. For pricing details, visit: https://creative.adobe.com/plans?plan=individual&sdid=KGXGU.